By Anne Templeton and John Drury. What is a crowd? The answer to this question has implications for planning, crowd safety management, and computer simulation of people movement. A common definition of a crowd is a large group of people that are gathered closely together. Yet a wide variety of very different phenomena are covered by this definition. This includes the gathering of people on the platform at a busy underground railway station during rush hour; the people each moving in different directions in a busy shopping centre; the large group of visiting supporters heading to a football stadium, who are singing and chanting; and the mass of people at a concert responding to their favourite track by clapping and standing together. In two of these examples, but not the other ones, the crowd seems to behave as one. For both understanding and effective practice, we need a way to capture that crucial feature. In psychology, we refer to these different types of crowds as physical versus psychological crowds. A physical crowd is simply a large group of people that are gathered together in the same place. A psychological crowd is one in which those people share a social identity. This means that these people categorize themselves as one – as an ‘us’ or ‘we’, rather than simply as ‘I’ or ‘me’ in relation to other people in the crowd. A single physical crowd can contain no psychological crowds (as in our shopping centre example), onepsychological crowd (the mass of people at a concert), two psychological crowds (two separate sets of football supporters in the same place), or more. Shared social identity in a crowd has a number of behavioural consequences. For understanding people movement, four of these consequences can be highlighted. First, people who share social identity are more able to coordinate with each other than are people in physical crowds. Such coordination is possible because each assumes that the other shares the same goals; therefore each can anticipate the other’s actions. This is as true of a Mexican wave as an urban riot. In an evacuation, this ability to anticipate and coordinate can be the difference between an orderly escape and a blocked door-way. Second, people in psychological crowds talk to strangers more than they do in physical crowds. Our study of a crowded outdoor music event found that the more that people identified with the crowd, the more they spoke to strangers. Consequently, people experience psychological crowds as more friendly, and they refer to the ‘atmosphere’ in these kinds of crowds (but not in physical crowds). This also has implications for how people move, where they position their bodies in relation to others, and how they form subgroups, in a crowd. Third, then, proximity behaviours are different in physical crowds. It has been demonstrated experimentally that people will prefer to be closer together in psychological crowds than in physical crowds. This has also been shown in the field, for both static and moving crowds. In each case, the more that people identified with the crowd, the more they tended to be comfortable and seek out the most crowded locations. We recently demonstrated the consequences of this for crowd flow. 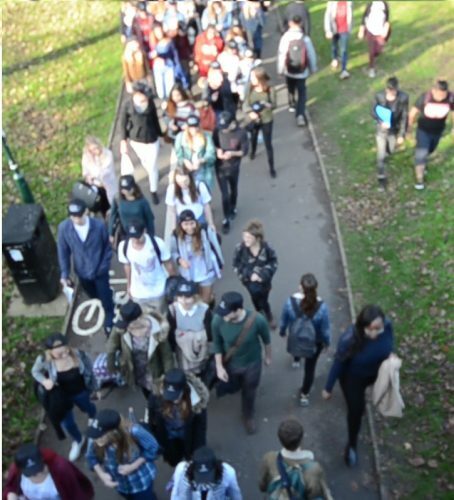 Compared to a physical crowd (Figure 1, below), people moving in a psychological crowd (Figure 2) try to stay together. They also move in larger subgroups than when they are in a physical crowd. Because of this, the overall speed of the psychological crowd can be slower than for a physical crowd. Moreover, those encountering the psychological crowd from the opposite direction typically try to avoid walking through it – they treat it as an entity (which probably reinforces the sense of entitativity within the psychological crowd itself). Fourth, a shared identity means shared group norms. The psychological crowd will have shared values and rules, and these will shape some of the common behaviours. This can include orienting together to valued locations. For example, at the annual Hajj to Mecca, Shia Muslims (in contrast to the Sunni majority) prefer to worship in the open and so avoid roofed areas for praying. An example from football is the local knowledge of short-cuts and preferred routes that seasoned supporters will take to a stadium, and the pubs on the route favoured by the most boisterous fans, where more singing, chanting and hostility to rivals is to be expected. It follows from the above that, as well as physical properties like location layout, crowd number, and average size of individuals, more accurate understanding and prediction of pedestrian behaviours and people movement in general will be enhanced by including in models and simulations the notion of psychological crowds. Yet our recent systematic review of 140 peer-reviewed articles on crowd modelling found that most computer simulations have not done this yet. In the first place, most published accounts of computer simulations of different crowd behaviours (including evacuations) treat them simply as physical crowds – either as a homogeneous mass or as a mass of individuals. But, second, those approaches which recognize the need to include psychological ‘groupness’ within a crowd model ‘groups’ in only limited ways – essentially as small groups within a crowd, not as a social category that people identify with across the crowd. Treating crowds as aggregates of small groups or as unconnected individuals excludes the ability to accurately model collective behaviour of psychological crowds where the entire crowd members coordinate together as a unit, such as fans entering a football stadium. Models which treat the crowd as a homogeneous mass neglect the underlying reasons for the collective behaviour, thereby limiting the range of scenarios that can be modelled. For example, these approaches cannot model scenarios where two psychological crowds with different social identities are present in the same location, such as fans of opposing football teams outside a stadium, where the crowds respond in different ways based on their different social norms and values. 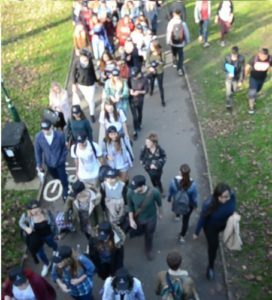 Moreover, current models tend to portray crowd behaviour as static, where changes in behaviour are limited to modifications such as altered walking direction, speed, or finding leaders. By incorporating some of the psychological underpinnings of psychological crowd behaviour into models, we can capture a more diverse range of crowd scenarios. We suggest two kinds of innovations in particular are required. First, the pedestrians in the simulation must be able to have different social identities in order to be members of different groups. 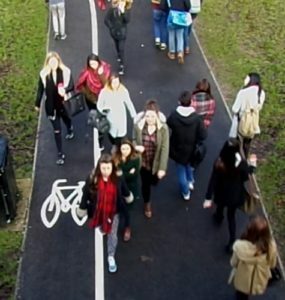 Second, the pedestrians should have knowledge of their own group identity and the identity of others in the environment. This can allow for dynamic situations such as two psychological crowds coming together as a single crowd (e.g., fans of opposing teams coming together as fellow football fans), and emergency situations where pedestrians who were previously unconnected become united through the shared fate they experience in the emergency. The Social Identity Model Application by Isabella von Sivers and colleagues has made progress towards incorporating research on crowd psychology into a model. The model is based on our study of the behaviour of survivors of the July 7th 2005 London underground bombings. This study found that survivors developed a shared social identity which led them to give support to others around them, slowing their own evacuation. Von Sivers and colleagues created a simulation in which they gave some agents social identities and social norms of helping injured ingroup members. The simulation replicated the pattern of egress behaviour found in the real event, in that evacuation time was slower for those agents with the shared social identity. Computer simulation are increasingly used to predict and monitor people movement, yet they predominantly assume that crowds are homogeneous or heterogeneous masses, or are comprised of small groups. We suggest that to be able to model the movement of psychological as well as physical crowds, simulations should include aspects of social identity. Including social identities, and norms associated with these identities, will allow modellers to create more realistic simulations of collective behaviour across a wide range of crowd events. This article was originally published in People Movement Online.